Our winter has been, thus far, more mild than last year. Less snow to shovel, and warmer temperatures. Still a photo of warmer times may help take off the chill. The wooly worm is a common focus of folklore regarding winter weather predictions. A nice summary of wooly worm trivia can be found at this University of Illinois Extension webpage. This particular caterpillar was crawling along a trail in Pioneer's Park near Lincoln last September. It won't be long before spring! In the past year, we've displayed our photo show, "Beneath the Sands: a photojourney of our year in Namibia" in 4 different locations. We've certainly gotten good mileage of the display we created to bring home the sights and emotions of our Fulbright year. We can add one more gallery to our list---bringing our total to 5 shows. During the next week (Jan. 24-28), the show will be in the Rotunda Gallery in the Nebraska Union on City Campus at UNL. It's right by the food court, near the north door of the Union. The Show is a good mix of animals, people, landscapes and some poetry thrown in for good measure. The entire family gets in on the act. Feel free to stop by any time during the week, if you have somehow missed the other displays! Every time we display the photos, the show looks a bit different. This may be the most 'professional' display, yet--it's a very nice space. If you can't come see the photos, you can view them (along with descriptions of the stories behind the photos) here. The file is about 8MB, so be patient. The poetry in the show is for sale as a book (accented by photos from the Photo Show). Well, we hung 38. Five times! As of this writing, we're still together. It's the beauty of the Fulbright Experience. Our thanks to Fulbright for the experience, the galleries for their invitations, and to Dee Ebbeka for helping us create the display. 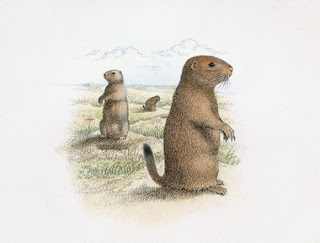 As Lewis and Clark were leaving Nebraska (Boyd County) in 1804, they discovered the species which became known as 'prairie dogs' . The story is that they were so taken with prairie dogs, that they shipped a live one to President Jefferson. Since then, prairie dogs have taken it in the shorts, as many ranchers view their large 'towns' as competition for grazing animals. If you want to start an argument in ranch country, just mention prairie dogs. Neighbors fight about them...afraid their towns will spread onto adjoining land. A few years ago, the Nebraska Game and Parks Commission made national news when they passed a resolution that forbade any of their biologists to work with prairie dogs, including participation in a regional Prairie Dog Management Plan with surrounding states. At their next meeting, they were forced to recind their vote after they were reminded that the state wildlife management agency was tasked, under the Public Trust Doctrine, with managing all wildlife for the good of the people in the state--they could not adopt a policy to 'not manage'. Since that time, the "good of the people" has mostly been interpretted to be a 'hands off' policy, with most decisions going in the favor of landowners who wanted to restrict or reduce prairie dogs' range in Nebraska. All of this makes yesterday's announcement from the Commissioners more interesting. The Commissioners voted to approve the transfer of 100 prairie dogs from Fort Niobrara National Wildlife Refuge (near Valentine, NE) to the Hutton Niobrara Ranch Wildlife Sanctuary in Rock County. The Hutton Sanctuary's request had been turned down, previously--with the Commissioners siding with neighbors who were concerned about prairie dogs spreading to their land. Why the change? Not sure, but ALE is on the case. In the meantime, 100 prairie dogs have a new home along the Niobrara River corridor. Are the winds changing with regard to prairie dog policy in Nebraska? Probably not dramatically, but this does represent a change from policy that I've seen since coming to the state in 2001. "Discovered a Village of Small animals that burrow in the grown (those animals are Called by the french Petite Chien) Killed one and Caught one a live by poreing a great quantity of Water in his hole we attempted to dig to the beds of one of those animals, after digging 6 feet [1.8 meters], found by running a pole down that we were not half way to his Lodge... The Village of those animals Covd. about 4 acres [1.6 hectares] of Ground on a gradual decent of a hill and Contains great numbers of holes on the top of which those little animals Set erect, make a Whistleing noise and whin allarmed Step into their hole. we por’d into one of those holes 5 barrels of Water without filling it. Those Animals are about the Size of a Small Squ[ir]rel... except the ears which is Shorter, his tail like a ground squirel which they shake & whistle when allarmd. the toe nails long, they have fine fur." *Image from a National Geographic website. Illustration by Gerald Rapp & Cullen Inc./Laszlo Kubinyi. Today was a 'discussion day' in my Wildlife Ecology and Management class. The topic was the Public Trust Doctrine, which is a principle which states that some natural resources should be reserved for public use, and that our government is charged with managing those resources. State and federal governments share a role in management. States are responsible for managing wildlife, but the federal government steps in with regard to migratory species (they cross state boundaries), endangered species (coordinating responses), and interstate commerce. As I've blogged before, one very tricky issue is the role of outfitters in states, with regard to interstate commerce. Outfitters often argue that states should not be able to regulate their activity, because they are engaging in interstate commerce---bringing hunting and fishing clients from other states. State residents get upset if outfitters and their out-of-state clients get special privileges. It's a grey area in the public trust doctrine, for sure. So, it makes for great discussion material...and I had arranged a class discussion on outfitters in Nebraska. Then, some of my colleagues informed me that Senator Avery, from Lincoln, had introduced a new bill in the Legislature...just this week. LB442 would require all outfitters to be registered with the Nebraska Game and Parks Commission, as well as paying a fee for that status. What perfect timing---a great addition to our discussion today! Sometimes, we teachers get lucky. It will be interesting to follow this bill. If successful, it will end the days of small-time outfitters. Paying $1000 in an annual fee will take away most of their profits. Big-time outfitters may be able to afford that fee, but it's a dent in profits. Their charges to clients will probably go up. However, that may be the price of doing business. Other businesses have to pay fees to operate. I've never used an outfitter in the US, but as the photo above attests, I have paid for hunts in southern Africa. They were not cheap, but Uwe and Claude (pictured with my kudu) were worth every penny. 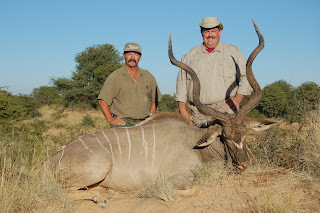 Also, the Namibian guides are regulated by a in-country Professional Hunters Association who charges fees and makes guides pass a test before certifying them. These guides help make ecotourism Namibia's second-largest segment of its economy! Many US and Nebraskan landowners, smelling potential for profits, have started charging for access to land. "Want to hunt on my land? It will cost you $50/day." As one of my colleagues rightly points out---most of those landowners rarely report those fees to the IRS. These fees aggravate many in-state hunters, who point out they are having to pay to access wildlife that, by definition, is their property---along with the landowner. It is possible that this bill, as defined, may end that practice. How will current decisions impact access to the wildlife that we, as Nebraskans, collectively 'own'? Stay tuned. Last fall, our family was invited to give a talk about our year in Namibia. The invitation came from the School of Natural Resources, and our presentation was on a Tuesday evening for the public. Since then, we've had lots of inquiries about that talk, and whether it was available as a video. Our genius multi-media people in the School of Natural Resources have pieced together a video of our presentation, along with close-up views of the slides that we showed. Our title was "Living with lions in Namibia: how a year and three suitcases changed our lives". Kelly shares her experiences with orphans and vulnerable children, and Tristan shares some of his most memorable experiences, as well. So, if you're interested, enjoy! You can link to the video as this web page: go here. Here's a more-than-hilarious video of animal voice-overs from the BBC. The anthropomorphisms in the video probably will make some of my colleagues shudder--one of the first lessons we teach in Animal Behavior classes is to be careful ascribing human traits and behaviors to animals. However, Aldo Leopold, as he wrote "A Sand County Almanac" used anthropomorphism as a technique to show that humans and animals were all part of the same community. Not a bad thing to remember. And, it's just darn funny. 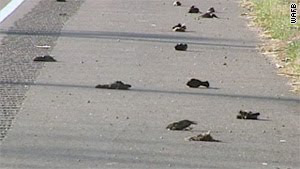 The recent rash of mass bird deaths prompted one "ALE" reader to ask me to comment. For those who have not heard, several hundred blackbirds fell to the ground in Arkansas, and officials seem to have determined that the flock's flight through New Years fireworks is to blame--rather than any disease or other option. Similarly, there were mass fish die-offs in the Chesapeake Bay and Vietnam, as well as crabs in Britain. People are calling the rash of die-offs, "AFLOCKALYPSE"! Seth Borenstein of the AP wrote a nice article, which appeared in our Lincoln Journal Star this morning. He documents that these mass deaths are a regular occurrence. Apparently, even Glenn Beck believe there is no reason for mass hysteria. If you want to see where mass die-offs of animals occur, you can link to this Google map. Make a poster for your wall, perhaps! However, I think it is interesting to think about why "WE" react (as humans) to news of such events. Why do we care if 5000 blackbirds fall from the sky? Well, it should be fairly well ingrained in our behavior to wonder if the mass deaths mean that we might be next. Concerns from certain diseases that animals pass to humans are certainly worth our concern, in some rational manner. And, for the portion of the human population that has trouble sleeping at night, we might also be concerned whether 'we' are doing something to cause these deaths. The deaths of vultures in India have caused the country to ban a drug, Diclofenac, that was being used as a livestock treatment. The vultures ingested the drug when they ate carcasses containing the drug, which is toxic to vultures. So, it's not a bad idea to think about these mass deaths. The most interesting reason for our 'gut reaction' to these mass deaths may be a little more psychological and personal. Throughout our evolutionary history, humans have small numbers of offspring, with long generation times, and fairly low mortality rates---relative to the rest of the animal Kingdom. Thus, our reaction to mortality events is fairly sensitive. Crabs, blackbirds, and fish are at the opposite end of the spectrum---they have tens, or hundreds, or thousands of offspring, and they have relatively high mortality rates. So, their populations are not as sensitive to mass death events. But, we look through the lens of our own mortality. And, armed with cell phones and the internet, we start to see mortality around the world...not just around us, locally. I study mortality in birds...so perhaps I am a bit jaded. When we hire new technicians to work on our projects, single mortality events are much more shocking to them. By season's end, they have perspective. One-third of all female prairie chickens will die between breeding on the lek site in March/April and their nesting attempt in May. Two thirds of all songbird nests fail (no fledglings). Up to 95% of duck nests fail (no ducklings). Nature is red in tooth and claw, as someone once said.